If you have any questions, comments or concerns, feel free to give us a call or email us at any time. Check in is any time during our business hours. 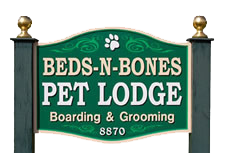 The first day is a full day charge; however, there is no charge for departure day Monday-Saturday if you check out your pet by Noon (just like a hotel). Boarding charges begin on the day of drop-off regardless of time. Most kennels are closed on Sundays, but as a courtesy to our customers, we provide checkout on Sunday afternoons. As animal lovers ourselves, we understand how eager you are to be reunited with your pet. There is always a full day charge when picking up on Sunday.